Okay, we need fodder. Post your topic ideas here. There is no hard and set rule here, but there are some things to keep in mind. A character is an individual. This means that we are dealing with a specific person or creature, whatever it is. You can get as detailed as you want, or as vague as you want. But something individual, something unique, has to show through for your description to be a true character. Unrelated words strung together do not a character make. EXAMPLE 1: The Lizardman. This character is a member of a jungle tribe, and a member of the priesthood. This character holds a fair amount of authority and has a lot of presence in public, and as such must be dressed according to ceremonial ritual. The temple he is a member of is the Temple del Sol - Temple of the Sun. His design must reflect his affinity with the bringer of life, the giver of light. He should be armed, but not heavily. EXAMPLE 2: Commodore Billipickfinster has just been ordered to take his Airship fleet and use their atomics to sterilize the Koochi-koochi invasion... by destroying his home city, where his family is trapped. In presenting your ideas, anything that gets the sense of a *character* across, stands a good chance of being used. The more characterized, the more personality you pick up from the description, regardless of how many words you use, the better. Last edited by Quinn Simoes; April 18th, 2013 at 04:56 PM. The Medieval Superhero - What if a superhero would be born into the medieval world. Sharing the ideals and knowledge of those around him/her but with fantastic powers. No wizzards or magicians. It is fine if he population believes he/she is a magic-user, but it should be clear to the persons seeing the image that it is not a wizzard, mage, sorcerer/ess or other "magic wielder" of typical look. The Host - Many things are described as "the Host", angelic choires, fae armies. One of the defining points of the Host is that on an individual level, they are also called "the Host". Research material can be found on wikipedia and monstropedia ( http://www.monstropedia.org/index.php?title=Sluagh sluagh means "host"). This is an open ended topic. "the Host" can be many differen things: Angels, Demons, Faerie creatures. Your job is to depict ONE of them. What if the dinosaurs were not extinct, and evolved into a civilized race instead of the small furry mammals? He comes from the future to get rid of all these pesty bugs from the present. Daddy, Mummy, the Kids, the Dog and the Cat. A family born in the lightning, living now in your neighbourhood. Your chief, king, boss, mistress, or whatever orders you to do some task. Standing before him/her, you have done the task already, and somehow it should obvious for all others except for the taskgiver. the point here is to show what they have in common (thru atmosphere, or attitude or wtever) while still maintaining each's individuality! you can invert boi and girl if you like but they must be recognizable right away, meaning: with one glance one shd be able to tell who's the emo and who's the bubble goth. PS: i like the Frankenstein Family idea! Militaristic Necromancer - Think of a modern day soldier crossed with a Necromancer. A robe with a camouflage pattern perhaps? Give a staff that doubles as a rifle maybe? He commands armies of skeletal troopers. Possibility of helmet, or just some bald guy with an evil look. I was imagining a scene where he is standing on a something, say a cliff, or a small hill, facing the enemy, and his army is already charging, or is getting ready to charge. The liar - a character that is ready to do everything to have his outer appearence lead him to success. It has no particular value but has an overwhelming presence. Helmut - character full of vice, physically weak, but has enough knowledge to defend himself in any situation and create technical prowesses. I think doing a Supervillian would be SO much fun! Hunchback of Alpha Centauri- So we know the story of the Hunchback of Notre Dame. This time around though, you are required to make a character conceptual of a Hunchback of another Solar System. This is fairly open-ended, it can be a human character, or an alien character, but it should represent the original Hunchback fairly well, and by that we mean that it should be Quasimodo (which means "almost like", possibly reffering to him being "almost like a human being" but definately not). Do research, stay away from disney. We want a character concept, for this reason, we would like to see either some facial expressions or an orthographic view. I had sent this to daestwen a bit ago, but wanted to post here now that we have the new suggestions thread. There's a decent wiki article here and a great segment on body snatching in the book Stiff: The Curious Lives of Human Cadavers by Mary Roach, available at Amazon.com. I think it would make for a great topic - plenty of atmosphere and mood! I'm sure the backgrounds/environments would be great, and lighting schemes with shuttered lanterns and London fog - I'm getting goosebumps! Has CHOW ever done an Apothecary. Could be kewl. The Four Businessmen: What if The Four Horsemen (War, Famine, Death and Pestilence) were high-profile businessmen, and what would their businesses be? Design one of the Four Horseman to fit this scenario and choose a business/company/corporation you think they would lead. You can make one up, as long as it fits within the style and atmosphere of your painting, and your businessman. Description could be avoided by wit in your painting. Attributes of each horseman should be researched in order to fit the style you deem suitable for the horseman/businessman of your choice. Last edited by Sir Bret; April 18th, 2008 at 03:26 PM. - Death is not just about taking people to the next life. Death just wants to chill some time, maybe play some video games, get something to eat, or hang with friends. -A race of beings gifted with incredible intelligence and created large machinces to help with various tasks. However, the story goes that during a routine upgrade, many of the machines went berserk, killing many. Their rampage continued, engulfing the god's homeworld. The gods developed a different kind of machine. They hoped that the current machines would help destroy the berserk machines. The gods rallied behinded the leader of the new machins and his famous war cry: "Transform and roll out." Leper Messiah: Humankind next salvation is not Tom Cruise for sure, what kind of social reject will be the new hope of humanity? Jack O'Lantern Once, a good many centuries ago, there was a mortal ne'er-do-well by the name of Jack, who managed to get the Devil to swear (on whatever it is the Devil swears to) to never take him into Hell. Unfortunately for our hero Jack, being denied entrance to Hell does not necessarily grant you access to Heaven. Now Jack's spirit wanders through the darkness, his way lit only by a lantern made of a half-eaten turnip and a coal from Hell's fire. 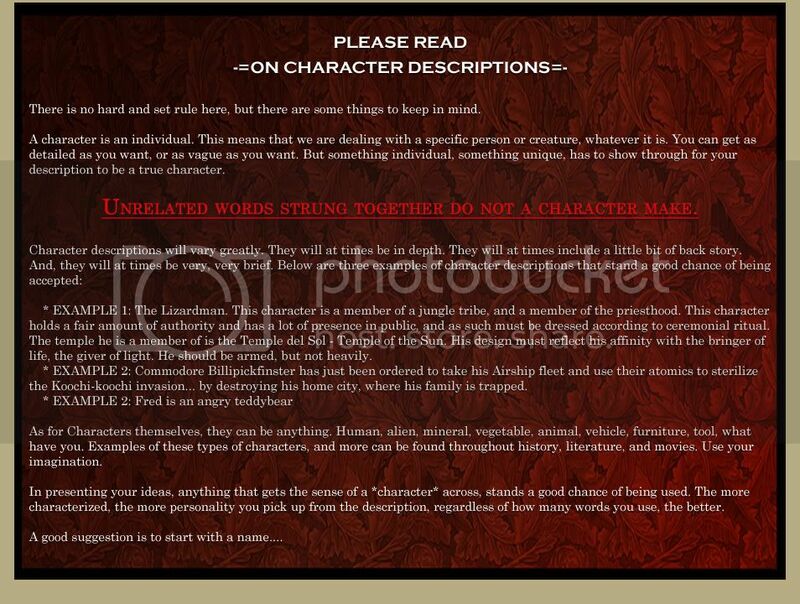 Simply create a character(illustrated suitable for inside a book, suitable for either children or adult, your choice). Aged 7-9. Basicly he/she is born from a poor peasant family during Dark ages( 200-800AD). With very little money for expensive items. Dressed in rags, but yet already showing characteristics of his/her future self, who would later become a national hero, as a great warrior or even dragon killer. Can be in any civilisation, european, americas, asian, etc.. as long as its a recognisable earth culture between the chosen dates. Also must show some kind of facial expression , (no manikins) Also since its illustration based, no plain white background. Might I suggest... Britannia, embodiment of the British Empire and its dominion over the world ? Dwarf don't love gold, that is just something we say to get into bed. Master of Zombies: ussually a necromancer or a vampire is the one controlling zombies, but this is a zombie not necessarly smarter, or stronger, but somehow, is the leader of a horde of zombies. Non human vampire: either animal, alien, or inamate object. Nature geek: an animal or plant that its a geek. Could also be star-trek/star wars fan boy, D&D player, or a simple nerd, but is not human. recreation of a mythological hero. It can be an Mythological hero or god from either Greek or Roman mythology. Each main god or hero usually has some animal or symbol to go with them so incorporating that in the CHOW would be benifital. Example: Zeus, symbol is the lightning bolt, Neptune: trident and the horse(i think) Things like that i think would make an awesome CHOW and force people to really do some research. Please read the first post in this thread before presenting your ideas. I'm seeing a lot of ideas that have potential, but will most likely *NOT* be used because they are just a stereotype. Include more detail around your character idea. Show me that you've thought your character idea out before presenting them. Re-animator - "A dedicated student at a medical college and his girlfriend become involved in bizarre experiments centering around the re-animation of dead tissue when an odd new student arrives on campus"
Modern God - a modern depiction of a god , since people stopped believing in the old gods, they started blending with the mortals. Plastic Surgery Addict - An narcissistic, obsessive male OR female, who has had many, MANY alterations to their face and body, so many surgeries they look comical or even creepy. Implants, nosejobs, botox, you name it, they've had it. A possible sidebar could be the character BEFORE any surgery. The Blind Birdkeeper- He lives in a dingy apartment, situated in New York, and his only pride and joy are the collection of exotic birds he keeps in cages atop the building. He's blind, but he knows every single bird by name according to texture, size, and sound. The Devil Really Wears Prada- A female Devil, or some kind of female demon from Hell that dresses in the latest Prada fashion line. She's cold and fierce and has a lesser demon, that can transform into a purse. So maybe our vision of the infamous russian madman mystic...with a bit of a twist. when i lay my vengeance upon thee!!! Dont let these shakes go on"
You can call me lame if you want ;P but I thought that kind of character would be really interesting. If vegetable oil is made from vegetables, and olive oil is made from olives, is baby oil made from babies? This is like a 'The Suffering/Condemned' thing. Urgh, nasty - I can just imagine what they'd look like. Very freaky ChOW if it was ever selected. Kudos for the good idea, CrissCross. First Approach: Design a philosophical mastermind; this ChOW would require you to pay attention to facial features as usual - but the rules are that the character must imply a suitable demeanour, in any form. This could be attained by just researching intelligent-looking people (Morgan Freeman, anyone? ). Try to recreate the glint, intelligence and humour in their eyes - or maybe go for a more direct approach by taking inspiration from any Esoterica teachings that are available - or even portraits, such as Francis Bacon (a 15th/16th century English philosopher), Jacob Bhoeme, Socrates (said to have had his own Daemon) Rudolf Steiner (founder of spiritual science), Leonardo da Vinci etc. A concise explanation of the Esoteric world is in Jonathan Black's "The Secret History of the World" - very interesting and intriguing stuff sure to strike some visual chords. Second Approach: could be to design a character that best shows the spiritual Brow Chakra (the Third Eye to the spirit world -http://en.wikipedia.org/wiki/Third_eye), the vegetable body form commonly referred to in Esoterica, or a Rosicrucian/Freemason/Dalai Lama buddhist master attaining an altered state of conciousness. Quite a bit of research would be involved to get the characters right. Remember that they had many ways of attaining that altered state: near-death experiences, drugs, thought patterns, intense teachings. Last edited by Sir Bret; May 24th, 2008 at 04:37 PM.